The evidence needed to prove insurance fraud is often well hidden, which makes uncovering that crucial ‘silver bullet' very satisfying. A substantial water damage claim was identified as suspicious by one of our adjusters during routine fraud screening. The customer, Miss A, had taken out the insurance policy just two weeks before the date of the incident and our Investigation Services team was appointed to look into the claim. Following a few days of freezing weather conditions, Miss A said she'd discovered a burst pipe in the loft at the risk address. The leak had caused extensive damage throughout the building, and a substantial reserve of £68,500, plus the alternative accommodation costs, had initially been set. A meeting was arranged with Miss A to discuss the circumstances further with our investigator. We were candid about our concerns – was the date of loss genuine and was the property occupied at the time of the incident? Miss A vehemently denied that the damage occurred before she arranged the insurance policy and stated that she had been permanently living at the risk address since 2 March 2018. During the interview, Miss A said that as soon as she discovered the damage, she contacted a local plumber for emergency assistance. She willingly agreed to show us the WhatsApp messages she had exchanged with the plumber to verify her actions. After much screen swiping, Miss A eventually showed us her mobile phone, but we couldn't see any supporting messages that dated the discovery at around 20 March 2018, the date of loss Miss A had given. 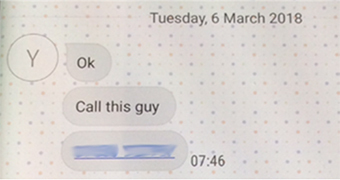 Smartphones store a veritable feast of useful information if you know how to access it, and – with the customer's consent – we scrolled through the conversation thread and found a suspicious message between the customer and a plumber, at 07:46 am on 6 March 2018. 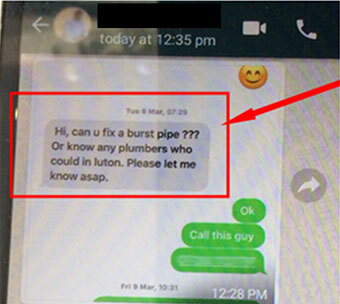 The messages sent by the plumber appeared to be in response to a previous message – perhaps an initial request for help – but there was nothing to support this on her phone. Miss A denied that she had sent an earlier message or made a call, and she stressed that the plumber was NOT responding to her in connection with the water leak. She agreed that an out of the blue message from the plumber beginning with ‘OK' was “a bit random”, and suggested that he must have been messaging about moving boilers around and it was nothing to do with the burst pipe. She repeated that the incident occurred between 17-20 March 2018, and definitely not before. Following our meeting with Miss A, we made enquiries with the next-door neighbour. She confirmed that the risk address had not been lived in since summer 2017, and she was certain that the water damage had occurred on or before the weekend of 3-4 March 2018. She gave some compelling and reliable reasons as to why she was so sure of these dates and provided a signed statement to this effect. We felt more could be gained from meeting the plumber who exchanged WhatsApp messages with Miss A on 6 March, and so insurers agreed that we should carry out further investigations. ...as suspected, the conversation on the morning of 6 March 2018 had been instigated by a message from Miss A. It was timed 7:29 am and referred to a burst pipe in the Luton location. Miss A had obviously deleted this part of the message from her WhatsApp records, to hide this detail from us. Together with the neighbour's statement, this new strand of evidence proved that Miss A's story was false and the risk address had suffered water damage before she arranged the insurance policy. Miss A had concealed the unoccupied status of the property and misrepresented the date of loss to gain financial assistance from her insurers. It's always very gratifying to uncover the evidence that proves insurance fraud. In this case, it saved insurers around £78,000, and endorsed our adjuster's concerns and subsequent referral of the claim to Investigation Services. It's this high level of joined up, collaborative teamwork that helps to reduce the impact of insurance fraud across the market.